One of the most exciting, and sometimes challenging part of welcoming a baby – is creating a unique space just for them. While safety and comfort need to be your first priority, you also need to design a space that is functional and practical. Here are my 10 tips for creating a nursery that will incorporate all of these elements! 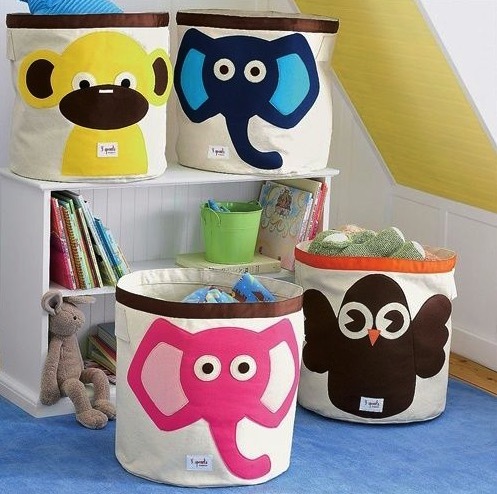 Whether you want to keep all of your child’s stuffies in one place or have all of their toys organized, baskets are your best friend. They come in all shapes, sizes and designs. Buy a couple bigger ones for the floor to throw toys in and grab a few medium sized ones to keep diapers, wipes, and creams in for diaper changes. They fit perfect in corners, under the crib, and on the change table. Plus they keep everything in one neat place, which keeps your nursery neat and tidy. I personally prefer canvas baskets over classic wickers ones because they tend to last longer and stay on trend as your child gets older. The 3 Sprouts storage baskets are my favorite. Not only are they cute, but they are durable, hold a lot and can be used anywhere in your home. A nice way to tie your whole room together is to create a feature wall. 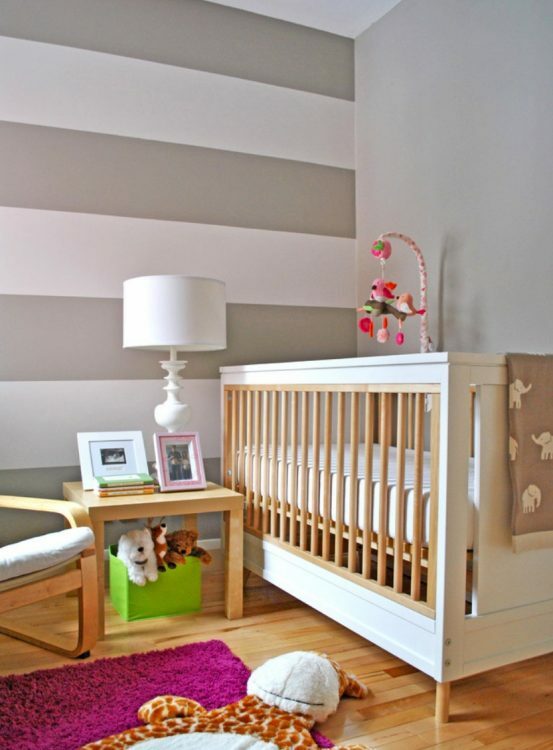 This is often the most effective when it’s the wall the crib sits up against and can be done with reclaimed wood, modern wallpaper, an elaborate decal or with a paint treatment. 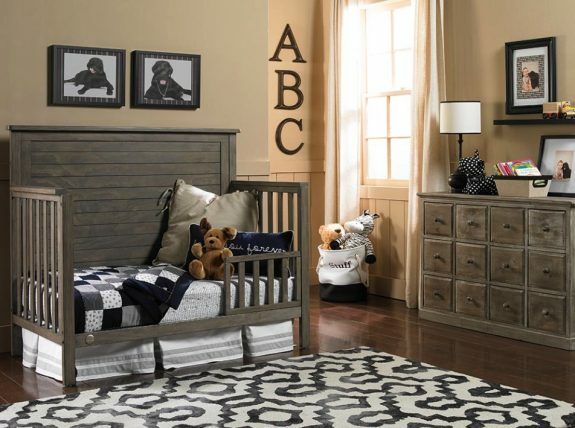 Buy a crib that can be used from birth to when your child is in their own bed. Many allow you to use the front and back as a head and footboard later, while also converting to a toddler bed in between. Fisher-Price(pictured below), Delta Children and Graco all sell 4-in-one cribs for under $300. Gone are the days where it would cost $4-500 for an eco-friendly mattress. Don’t get me wrong – there are options out there in that price range, but you can also find some that are between $1-200. 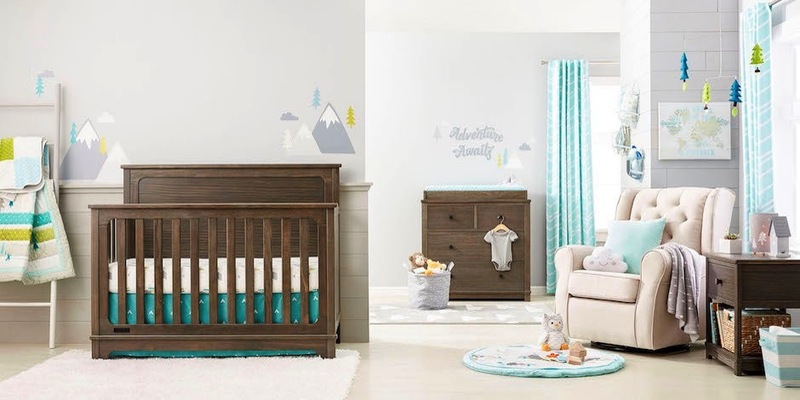 On the low end, Simmons has their Organic Rest crib mattress that retails for $100 and offers an organic cotton cover and a 99.9% VOC free thermo-bonded recycled polyester core. In the mid range, we love Babyletto’s Coco Core($269) because it is made from coconut husk and natural latex for long-lasting, firm, comfortable support. Nook’s Pebble Lite Crib Mattress($299) is also one we think is worth a look. It features a certified non-toxic foam core for comfort; air spacers made from BPA-free, recycled water bottle plastic for breathability; and an organic Pebble Wrap cover for a soft place to lay your little one’s head. Despite what you see in magazines, all babies need for bedtime is a fitted sheet and a swaddle or a sleep bag. Don’t waste your money on those elaborate ‘bed in a bag’ sets that come with bumpers, a comforter, a pillow, and sheets. A child doesn’t need a pillow until they are over the age of two, the comforter is too bulky and your baby could suffocate. 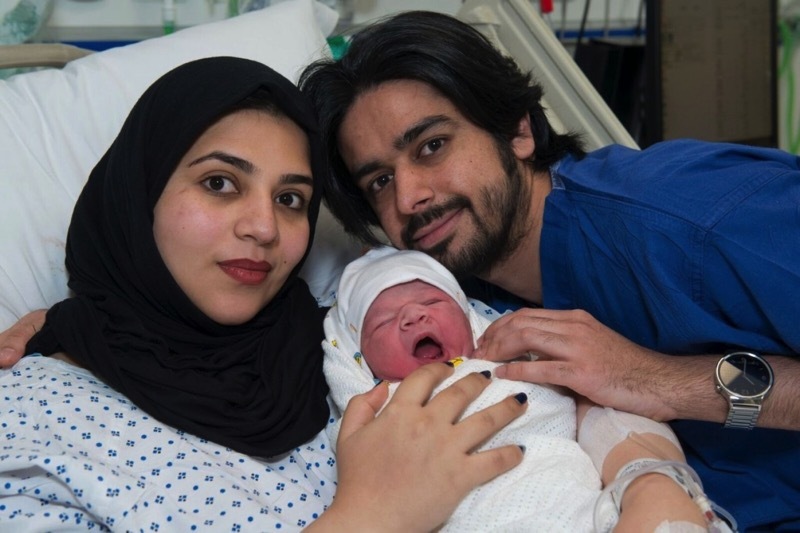 Bumpers are not recommended as they reduce the airflow through the crib and could cause your baby to suffocate as well. If you want to dress the crib you can get a nice sheet and skirt set for a fraction of the cost. Also, some companies like Sweet Kyla offer additional in the same print like curtains, throw pillows and baskets that tie the room together. 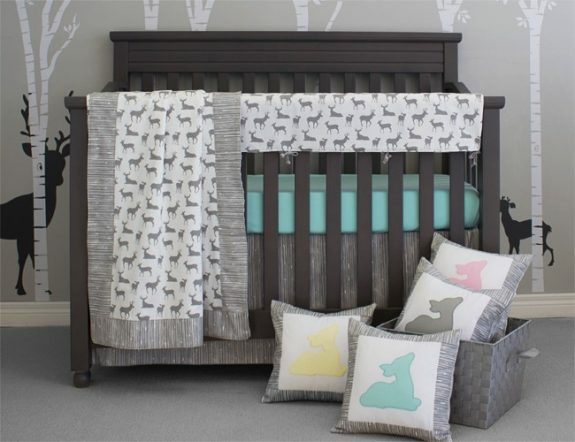 We also love their crib rail covers to prevent your little chewer from wrecking your crib. 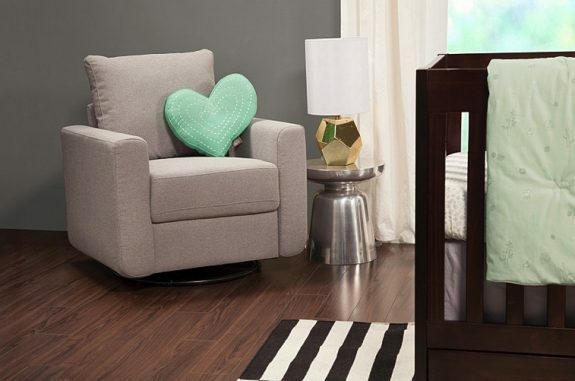 Pick a good chair for your nursery because when you are nursing your baby at 2am the last thing you want is to be cramped in an uncomfortable chair. Years ago a good nursery glider went for well over $1000, now you can get them for around $300. Babyletto’s Bento Glider is one of our favorites because it is soooo comfortable, beautifully designed and just $299. 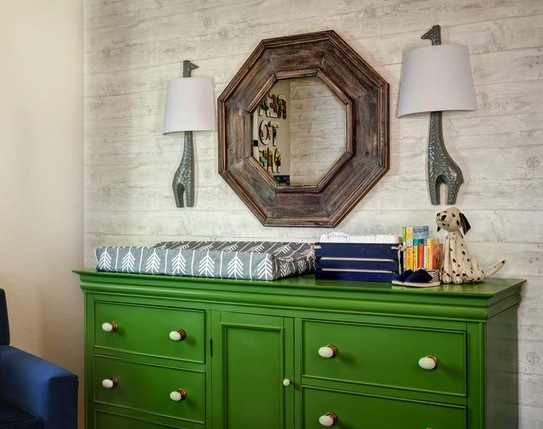 When picking your child’s dresser, choose something that will grow with them for years to come. A change pad can be affixed to any surface so buy a piece that is practical and offers a lot of storage for when they get older. Do you have some pictures of you as a child? Or a favorite book or print you loved? Frame it and create a gallery wall with pictures of the family. Later on, you can also create a shadow box with your child’s footprints, their hospital mementos, and other special items from the day they were born. 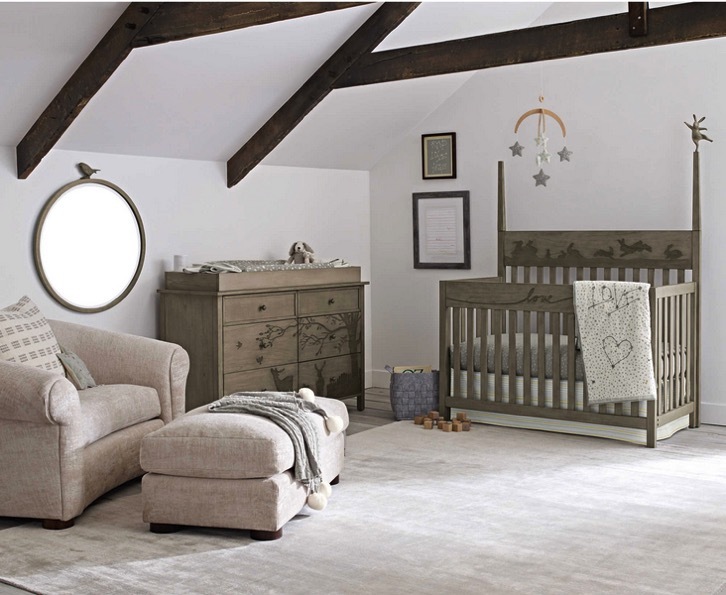 Your child won’t be a baby forever, so design a room that will grow with your child. Add fun elements that can be re-purposed and used in different ways. Also, pick a colour that can be used for years to come. 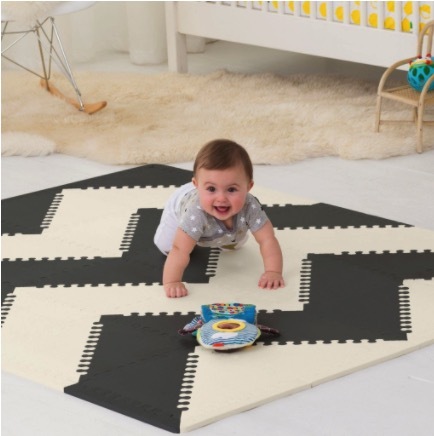 While hardwood’s durability makes it a good floor choice, make sure you add a nice comfy rug to the room that will sit under your child’s crib. I say this because when your child makes their first escape from their crib, they may take a tumble and you don’t want them to land directly on a hardwood floor. You could also use Skip*Hop’s Playspot foam floor tiles. They are beautifully designed in a variety of patterns and colors to suit any design style. Hilary Duff Hits The Market With Her Little Man!